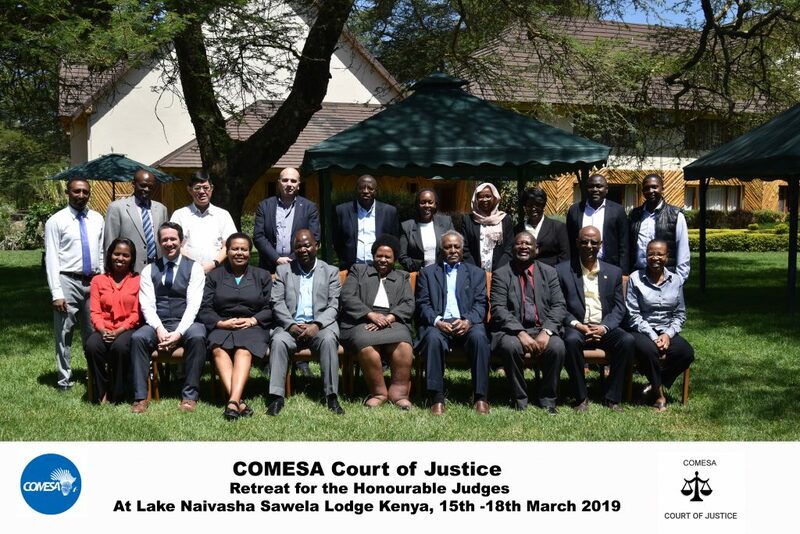 The COMESA Court of Justice (CCJ), held a retreat for its Honourable Judges in Naivasha, Kenya from 15- 18 March 2019. The theme of the retreat was, “The contribution of COMESA Court of Justice in ensuring the achievement of the aims and objectives of the COMESA Treaty”. The Judge President, Hon. Lady Justice Lombe Chibesakunda made opening remarks in which she expressed her hope that the retreat would lead to a deeper understanding of the COMESA Treaty. The CCJ recently adopted and implemented an Electronic Evidence Management System known as CaseLines and among the speakers invited wasMr. Lindsay Walsh from CaseLines who took the Judges through the System. It was indeed exciting to see the enthusiasm of all the Judges during this training. Other guest speakers included Hon. Dr. Justice Borhan Amrallah, a former Judge of the CCJ Appellate Division who is also an arbitrator of wide experience. He expounded on Article 28 of the COMESA Treaty and gave further insight on the arbitral jurisdiction of the CCJ. Hon. Dr. Justice Emmanuel Ugirashebuja, the President of the East African Court of Justice shared the EACJ experience and in particular, how the sister Court was interpreting Article 6 and 7 of the EAC Treaty. He expounded on several decisions of the Court, including some that reiterated the mandate of the Court in interpreting the EAC Treaty (the equivalent of Article 30 of the COMESA Treaty). He emphasized the need for regional courts to have regular interactions with national courts and tribunals so that they could come up with ways in which they can ensure harmonised interpretation of treaties from within their regions. Dr. Francis Mangeni, who is the Director of Trade at COMESA, took the Judges through the various programmes in COMESA. He discussed at length some of the barriers to trade within COMESA and the nature of disputes that could find their way into the CCJ. Among these is the levying of customs duty for goods exported from one COMESA Member State to another where the exporter has complied with the requirements of Rules of Origin (RoO). He explained the requirements for issuance of a Certificate of Origin and pointed out that the Polytol case was anchored on this issue. Prof. Gerhard Erasmus, a Legal Expert and Associate with the Trade Law Centre (tralac) gave an analysis of Articles 3 – 6 of the COMESA Treaty and a presentation on the latest developments within the African Continental Free Trade Area (AfCFTA) and its relationship with existing Regional Economic Communities (RECs). He also touched on BREXIT and the implications this might have on COMESA and other African RECS. The discussions were very lively and interactive and at the end of the retreat, the Judge President expressed her hope that such retreats would become an annual event.